Good nutrition from eating a healthy diet is the foundation of all natural health-healing remedies. Better nutrition will improve your personal health. Eating healthy is what natural health is all about. Anyone interested in improving his or her nutrition and wellness should eat a healthy diet. A commonsense guide is presented to achieving good nutrition from eating a healthy diet. Any change in your diet, however small, that improves your personal health is a step in the right direction. The biggest impact upon your health will come from dropping Added Sugar from your diet. The NEXT biggest impact will come from dropping junk food. Eating a healthy diet is a biological factor of the mind - body connection. The foods we consume should give our bodies the nutrients necessary for good health. The basic premise of any good diet is variety, balance, and moderation in what we eat regularly. Nutrition is a complex issue. Yet through exercising your own critical thinking skills and using plain, old common sense, anyone can obtain good nutrition from eating a healthy diet. Nutrition is the relationship of foods to the health of the human body. Good nutrition is obtainable without engaging in dietary extremes. Work on your nutrition by making small improvements in it. Over time, these changes add up to excellent nutrition. The objective of healthy nutrition is to end up, but not start out with, a perfect diet. Normally, it should take you between two and five years to achieve good nutrition from eating a healthy diet. Poor nutrition is the result of consuming too little, too much, or the wrong kinds of food, regularly. Food science, a root cause of poor nutrition, transforms natural whole foods into adulterated, highly processed, garbage that fills the belly while developing excessive human appetites for sugar, fat, and salt. Avoiding poor nutrition simply means refusing to eat junk food. To answer the question: "What is a good healthy diet?" we can compare what man used to eat to what the average modern person eats today (i.e., the Western Diet). The western diet  has twice the fat, a much higher ratio of saturated to unsaturated fatty acids, a third of the daily fiber intake, way too much sugar and salt, fewer complex carbohydrates, and a reduced intake of nutrients; compared with what the human species ate a mere ten generations ago. Please, remember that all that is being done here is an identification of the differences in diet that might be correlated with the recent increases in Lifestyle Diseases  and the obesity epidemic that is currently striking all developed countries. This article defines healthy nutrition. The case is being made that real food does not come out of vending machines, nor plastic bags. "People should know the facts. Then if they want to eat themselves to death, let them." -- Ancel Keys, PhD - Is best known for researching and promoting the Mediterranean lifestyle. In short, the Natural Health Perspective takes the nutritional position that traditional whole foods are healthier than modern Junk Food.,,,,,, And, that eating any food healthier than modern Junk Food will improve your personal health and nutrition. The long-term objective is to eat a reasonably good diet. How much effort you want to put into it is entirely up to you. Stop eating Added Sugar in your food! Cutting your SUGAR consumption down to ZERO, or as little as possible. Reducing your sugar consumption to No More than 15% of total calories consumed. Reducing your overall fat consumption. Reducing your saturated fat consumption to No More than 10% of total calories consumed. Increasing your consumption of fiber and nutrients by eating more fruits, vegetables, nuts, and whole-grains. Reduce your salt consumption to a maximum of three grams a day. "It isn't what you do once in a while that's a problem; it's what you do all the time. Look at the average American diet: ice cream, butter, cheese, whole milk, all this fat. People don't realize how much of this stuff you get by the end of the day." The Natural Health Perspective healthy whole food diet program has been broken down into three different levels: Beginner, Intermediate, and Advanced. The first step to eating healthy whole foods is to begin moving away from eating junk food, towards more healthy whole foods. Next, people should work on reducing their addition to Added Sugar. Finally, you should make sure that your whole food diet is supplying the right nutrients, in the correct ratios. Once that is done, then you would be in a good position to benefit from improving the quality of your foods by consuming organic produce and meats. 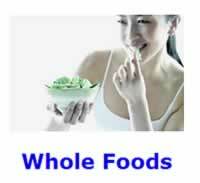 Several acceptable healthy diets exist that will grant you healthy nutrition and natural health. Choose the healthy diet that is best for you. Italian - "Cereal [i.e., whole-grains] and alcoholic drink consumption was high in Italy" during the '60s. A maximum of 40% whole-grains is recommended. You should be eating equal amounts of whole-grains and vegetables. Crete - "In Greece the intake of olive oil and fruit was high" during the '60s. Asian - The Asian Diet can be "characterized by a high consumption of fish, rice, and soy products." A reduced consumption of soy products is recommended, for those living outside Japan. Demi-Vegetarian - Provided you occasionally eat some fish and poultry or at least supplement with vitamin B-12. Demi-vegetarians are people who claim to have eating habits which focus on vegetarian foods, but who will eat fish and white meat on an occasional basis. In conclusion: from the Natural Health Perspective natural health is about promoting wellness and fitness through the natural therapies of eating a healthy diet, taking nutritional supplements, reaping the benefits of exercise, and having a healthy attitude and resilience in your life. The nutrition of eating a healthy diet is the foundation of natural health. Yet, eating a healthy diet is only one part of the Natural Health Perspective. Good nutrition and exercise are moderately difficult to carry out and offer mid-level rewards. "Diet, Nutrition and the Prevention of chronic Diseases, a Report of the World Health Organization Study Group on Diet, Nutrition and Prevention of Non communicable Diseases," Nutrition Reviews 49(1991):291-301. Sobra J; Ceska R. [Diseases of civilization from the aspect of evolution of the human diet]. Cas Lek Cesk, 1992 Apr, 131:7, 193-7. Zöllner N. [The relevance of diet for civilization diseases, especially atherosclerosis]. Wien Med Wochenschr Suppl, 1990, 106:, suppl 11-2. Burkitt DP. Western diseases and their emergence related to diet. S Afr Med J, 1982 Jun, 61:26, 1013-5. Painter NS. Diverticular disease of the colon. The first of the Western diseases shown to be due to a deficiency of dietary fibre. S Afr Med J, 1982 Jun, 61:26, 1016-20. Adlercreutz H. Western diet and Western diseases: some hormonal and biochemical mechanisms and associations. Scand J Clin Lab Invest Suppl, 1990, 201:, 3-23. De Villiers LS. Natural micronutrients as controlling factors in Western diseases--a lesson in nature-programming. Med Hypotheses, 1994 Mar, 42:3, 149-58. Adlercreutz H; Mazur W. Phyto-oestrogens and Western diseases. Ann Med, 1997 Apr, 29:2, 95-120. Kromhout D; Keys A; Aravanis C. Food consumption patterns in the 1960s in seven countries. Am J Clin Nutr, 1989 May, 49:5, 889-94. National Institutes of Health, News Release: NHLBI Study Shows Large Blood Pressure Benefit From Reduced Dietary Sodium, Wednesday, May 17, 2000. The Essentials of Our Health Program, Principle 2: The Fundamental Principle of natural health and fitness is Moderation and Balance in all things.